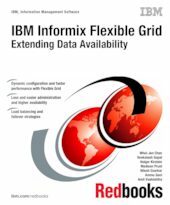 In this IBM® Redbooks® publication, we focus on, and provide an overview of, the high availability and Enterprise Replication features of IBM Informix® 11.70. Informix provides solutions for making data highly available in the MACH11 cluster. The components of the MACH11 cluster include High Availability Data Replication (HDR), Shared Disk Secondary (SDS), and Remote Secondary Standby (RSS) servers. Enterprise Replication (ER) provides a means of selectively replicating data between systems in near real time. The Informix Flexible Grid eliminates the administrative complexity of ER. Flexible Grid provides the ability to automatically create database objects, such as tables, indexes, and stored procedures, on all nodes within the grid as a single operation. These enhanced Enterprise Replication features provide solutions for those customers requiring reliable and quick dissemination of data across a global organization. There is also enhanced capability for customers requiring High Availability Disaster Recovery, in the form of the ability to resend primary server indexes to secondary servers without requiring a rebuild of the index on the primary server. Capabilities such as these enable faster, easier, and more reliable distribution and high availability of data, resulting in improved access and use throughout the enterprise.